The best getaways involve a trifecta of 1) delicious food, 2) refreshing bevvies and 3) epic things to do. But don’t venture too far—the perfect getaway is just a hop, step and a jump away! We’re talking about New Zealand’s unexpected gem: Dunedin. Less than a two-hour flight away, the city is so much more than scarfies. You’ll find a hub of all things mouthwatering, arty and oh-so cool. 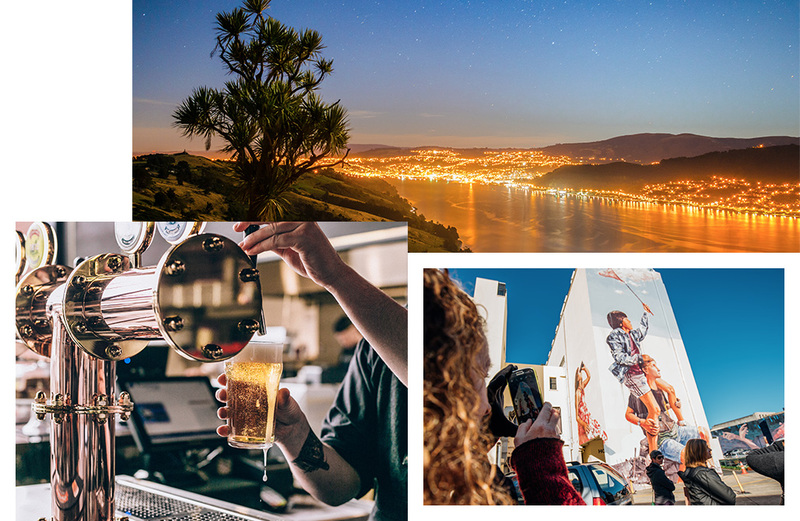 Put Dunedin on your 2018 bucket list and eat, drink and explore your way across the incredible city! Get there with Air New Zealand—they fly non-stop from Auckland to Dunedin three times every day. Check out these fab spots on your trip! Start your foodie adventure at harbourside eatery, Plato. The ever-changing menu is all about fresh, locally sourced ingredients with a whooole lot of seafood. Dig into the likes of crispy squid, seafood chowder and paua patties. Don’t miss out on their signature fish pie featuring a leek, mustard and bacon sauce—it’s the ultimate comfort dish! Sitting pretty by St Clair Beach, Starfish oozes beach-side vibes (Bondi who?). Dine al fresco outside or snuggle inside the relaxing café. The menu has all your brunch faves including eggs bene, French toast and comforting baked chili eggs. FYI you’ll also find expertly brewed L’Affare coffee alongside local Emerson’s beers. It’s the perfect pit-stop on a stroll along the esplanade. In Dunedin’s trendy warehouse district, you’ll stumble upon Precinct Food. Boasting exposed brick walls and an industrial fit-out, the café is totally #ontrend. They make everything from scratch with a menu that changes daily depending on what’s in season. Munch on house-made breads brimming with tasty fillings, bulky seasonal salads and divine cabinet treats. Hellooo ginger crunch! If you’re anything like us, you’re not one to turn down a good (good) burger. Get your meaty, cheesy fix from mouth-watering burger joint, Good Good. We strongly suggest you pair your burger with equally delicious tater tots, mac ‘n’ cheese balls AND fried chicken bites. Wash it all down with an unmissable milkshake and you’ll be away laughing. Once upon a time Jim Byars was a chef at a Michelin-starred restaurant. Now, he’s at the helm of The Highgate Bridge—better known as ‘The Friday Shop’. Open on Fridays and Fridays only, the world-famous shop sells all the best French-inspired delicacies, from ratatouille and quiche to chocolate tart and almond croissants. Make sure you get there early—they’re usually sold out by 10am. Calling all craft beer enthusiasts—this one’s for you! New New New (or simply just NNN) brews the craftiest of craft beers. Their innovative bevvies include the likes of chilli pilsner, poppy seed ale and an unmissable kaffir lime and lemongrass sour. Feeling brave? Order a pour of their aptly named ‘Fear Not’ stout—it’s flavoured with smoked eel! No visit to Dunedin is complete without a pint (or two) of the city’s famous Emerson’s beer. Established in 1993, the craft brewery has stood the test of time… and for good reason! Sip on a classic year-round beersies or go for an experimental seasonal brew (caramel stout, anyone?). Their Anzac Ave brewery operates behind-the-scenes tours daily. Arrive thirsty. Move over, Melbourne. Dunedin is a total street art hub. Download a map of the city’s street art trail then embark on a self-guided walk. The city is adorned with more than 30 artworks from New Zealand and international artists alike. Trust us when we say: these thought-provoking pieces will blow your mind. Did you know New Zealand—or, more specifically, Dunedin—is home to the world’s steepest residential street?! Baldwin Street has a slope of 1:2.8—aka for every 2.8 metres you walk (read: crawl), your elevation changes by a whole metre! Once you get to the top, there’s a much-needed water fountain paired with stellar views. The wild charm of Tunnel Beach will blow you away—sometimes literally, depending on Dunedin’s gusts that day. The breathtaking secluded beach (you have to walk through a tunnel to access it) is surrounded by sandstone caves and a rugged coastline. Pro tip: it’s best at low tide. If your visit coincides with a Saturday, grab brunch from the Otago Farmers’ Market. Located outside the historic Dunedin Railway Station, the market showcases fresh fruit and veg alongside food trucks and artisan goodies. Be sure to check out The Tart Tin and their Dunedin-famous doughnuts. Speaking of all things sweet and delish, Dunedin is also home to OCHO (aka Otago Chocolate Company). Handcrafted with love, the craft chocolate stars cacao beans ethically grown in the Pacific. See the chocolate making in action at their Vogel Street site—and stick around for a decadent hot choccie! It’s been ten years since Company Of Strangers launched their stunning fashion label in Dunedin. The 100% New Zealand-made range features dreamy garments, leather and jewellery. Check out their flagship store while you’re in town and buy all of the things—you totally deserve it. Put Dunedin on your 2018 bucket list and eat your way across the city! 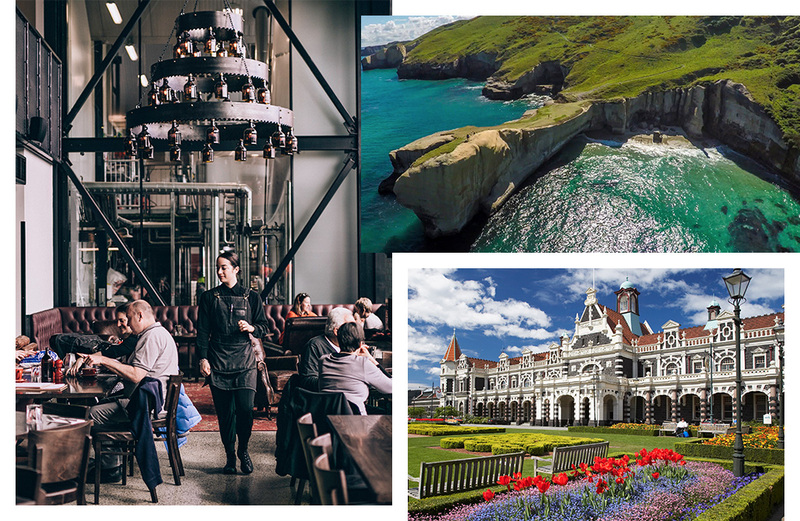 Get there with Air New Zealand—they fly non-stop from Auckland to Dunedin three times a day. Editor’s note: This article is proudly sponsored by Air New Zealand and endorsed by The Urban List. Thank you for supporting the sponsors who make The Urban List possible. Click here for more information on our editorial policy.